Wonderful apartment. Great to return home to and relax in after a day out. Beautiful views. Can only recommend this little “gem”. 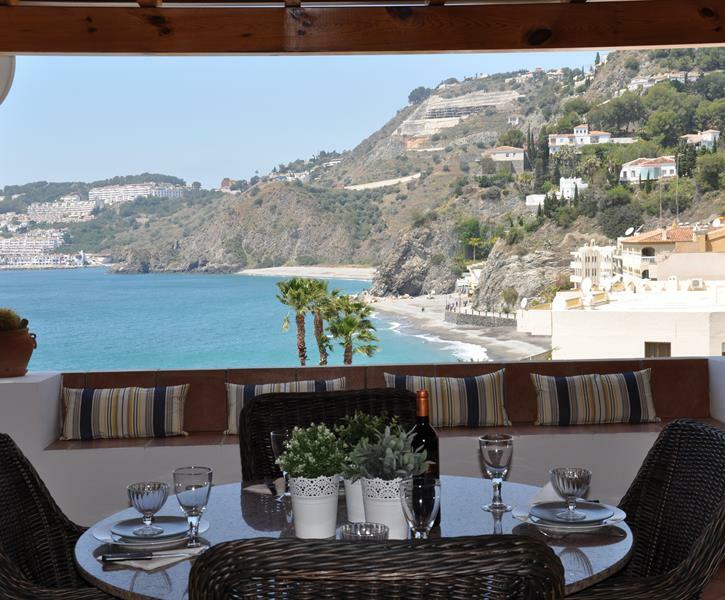 A beautiful apartment in the "chic" district of Cotobro, Almuñecar. With two bedrooms and bathrooms, amazing terrace and stunning views. The apartment has all the facilities that you will require to make your stay amazing with all facilities included in the price allowing you travel light, keeping your costs down. Thank you,All(Ryszard,Ewe and Gordon)for a such holiday!! Best experience ever. Very nice appartment: clean, spacious, nicely decorated and super well equiped. Great terrace with stunning sea views. The reception by Gordon & Louisa was excellent, the welcome pack was very useful! We visited the apartment for a relaxing time with a few visits to the Castle and also to Granada. It was fabulous! The apartment is wonderfully placed for the sand/shingle beach with an excellent restaurant just on the beach. The apartment has a wonderful balcony with a lovely view which may have reduced our visits outside because of its attractiveness. It was spotlessly clean and well appointed. Gordon Sandilands is the manager and if anything is not quite right or unclear he will go out of his way to help you or sort it out and he and his wife are responsible for the apartment's cleanliness and the welcome pack which greeted us. He also provided us with transport to the apartment from the airport and back again at a very reasonable rate. Ryszard and Ewa went out of their way to calm our worries about booking the, then unreviewed, apartment by providing a multiplicity of official documents they can not normally need to give out. We were also very impressed with the quickness of their response. Almuñecar and Granada are both very visitable places with many sites to see. If you want to visit the Alhambra, book your tickets before you get to Spain. It is very busy. We went by bus and ended up eating well and reasonably at one of the tavernas on the Paseo del Padro Manjon the other side of the river from the Alhambra. Almuñecar has lots of good restaurants and talk to Gordon about the tapas. This place is definitely 5 star in every aspect.